Glasgow ( /ˈɡlɑːzɡəʊ,_ˈɡlæʔ,_ʔsʔ/; Scots: Glesga; Scottish Gaelic: Glaschu [ˈkl̪ˠas̪xu]) is the largest city in Scotland, and third largest in the United Kingdom. Historically part of Lanarkshire, it is now one of the 32 Council Areas of Scotland. 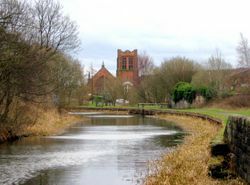 It is situated on the River Clyde in the country's West Central Lowlands. Inhabitants of the city are often referred to as Glaswegians or Weegies. In the late 19th and early 20th centuries Glasgow grew in population, reaching a peak of 1,128,473 in 1939. Comprehensive urban renewal projects in the 1960s, resulting in large-scale relocation of people to new towns and peripheral suburbs, followed by successive boundary changes, reduced the population of the City of Glasgow council area to 599,650 with 1,209,143 people living in the Greater Glasgow urban area. The entire region surrounding the conurbation covers about 2.3 million people, 41% of Scotland's population. At the 2011 census, Glasgow had a population density of 8,790 /sq mi (3,390 /km2), the highest of any Scottish city. Glasgow hosted the 2014 Commonwealth Games. Glasgow is also well known in the sporting world for the football rivalry of the Old Firm between Celtic and Rangers. Glasgow is also known for Glasgow patter, a distinct dialect that is noted for being difficult to understand by those from outside the city. Glasgow derives from Brythonic Glas Cau, "Green Hollow", referring to the Molendinar Burn. The Gaelic name Baile Glas Chu, town of the grey dog, is mere folk-etymology. The present site of Glasgow has been settled since prehistoric times; it is for settlement, being the farthest downstream fording point of the River Clyde, at its confluence with the Molendinar Burn. After the Romans left Caledonia, the settlement was part of the extensive Kingdom of Strathclyde, with its capital at Dumbarton 15 mi (24 km) downstream, which merged in the 9th century with other regions to create the united Kingdom of Scotland. The origins of Glasgow as an established city derive ultimately from its medieval position as Scotland's second largest bishopric. 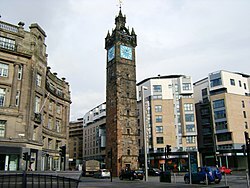 Glasgow increased in importance during the 10th and 11th centuries as the site of this bishopric, reorganised by King David I of Scotland and John, Bishop of Glasgow. Glasgow grew over the following centuries. The first bridge over the River Clyde at Glasgow was recorded from around 1285, giving its name to the Briggait area of the city, forming the main North-South route over the river via Glasgow Cross. The founding of the University of Glasgow in 1451 and elevation of the bishopric to become the Archdiocese of Glasgow in 1492 increased the town's religious and educational status and landed wealth. Its early trade was in agriculture, brewing and fishing, with cured salmon and herring being exported to Europe and the Mediterranean. Following the Reformation and with the encouragement of the Convention of Royal Burghs, the 14 incorporated trade crafts federated as the Trades House in 1605 to match the power and influence in the town council of the earlier Merchants' Guilds who established their Merchants House in the same year. Glasgow was subsequently raised to the status of Royal Burgh in 1611. Glasgow's substantial fortunes came from international trade, manufacturing and invention, starting in the 17th century with sugar, followed by tobacco, and then cotton and linen, products of the Atlantic triangular slave trade. Daniel Defoe visited the city in the early 18th century and famously opined in his book A tour thro' the Whole Island of Great Britain, that Glasgow was "the cleanest and beautifullest, and best built city in Britain, London excepted." At that time the city's population was about 12,000, and the city was yet to undergo the massive expansionary changes to its economy and urban fabric, brought about by the Scottish Enlightenment and Industrial Revolution. After the Acts of Union in 1707, Scotland gained further access to the vast markets of the new British Empire, and Glasgow became prominent as a hub of international trade to and from the Americas, especially in sugar, tobacco, cotton, and manufactured goods. The city's Tobacco Lords created a deep water port at Port Glasgow on the Firth of Clyde, as the river within the city itself was then too shallow. By the late 18th century more than half of the British tobacco trade was concentrated on Glasgow's River Clyde, with over 47,000,000 lb (Template:Convert/tonnes) of tobacco being imported each year at its peak. At the time, Glasgow held a commercial importance as the city participated in the trade of sugar, tobacco and later cotton. Although Glasgow Corporation had been a pioneer in the municipal socialist movement from the late 19th century, since the Representation of the People Act 1918, Glasgow increasingly supported left-wing ideas and politics at a national level. The city council was controlled by the Labour Party for over 30 years, since the decline of the Progressives. Since 2007, when local government elections in Scotland began to use the single transferable vote rather than the first-past-the-post system, the dominance of the Labour Party within the city has declined, but it remains one of only two local authorities, along with North Lanarkshire, where Labour maintains an outright majority over the other parties. In the aftermath of the Russian Revolution of 1917 and the German Revolution of 1918–1919, the city's frequent strikes and militant organisations caused serious alarm at Westminster, with one uprising in January 1919 prompting the Prime Minister, David Lloyd George, to deploy 10,000 troops and tanks on the city's streets. A huge demonstration in the city's George Square on 31 January ended in violence after the Riot Act was read. Industrial action at the shipyards gave rise to the "Red Clydeside" epithet. During the 1930s, Glasgow was the main base of the Independent Labour Party. Towards the end of the 20th century it became a centre of the struggle against the poll tax, and then the main base of the Scottish Socialist Party, a left-wing party in Scotland. The city has not had a Conservative MP since the 1982 Hillhead by-election, when the SDP took the seat, which was in Glasgow's wealthiest area. 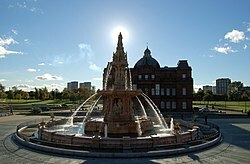 The general political bias against the Conservative Party continued, and as at 2016 they have only one of the 79 councillors on Glasgow City Council, despite having been the controlling party (as the Progressives) from 1969–1972 when Sir Donald Liddle was the last non-Labour Lord Provost. Glasgow is represented in both the Westminster Parliament in London, and the Scottish Parliament in Holyrood, Edinburgh. At Westminster, it is represented by seven Members of Parliament (MPs), all elected at least once every five years to represent individual constituencies, using the first-past-the-post system of voting. In Holyrood, Glasgow is represented by sixteen MSPs, of whom nine are elected to represent individual constituencies once every four years using first-past-the-post, and seven are elected as additional regional members, by proportional representation. Since the Scottish Parliament election, 2011, Glasgow is represented at Holyrood by 7 Scottish National Party MSPs, 7 Labour MSPs, 1 Conservative MSP and 1 Scottish Green MSP. In the European Parliament the city forms part of the Scotland constituency, which elects six Members of the European Parliament. Since Glasgow is covered and operates under two separate central governments, the Scotland and UK Governments, they determine various matters that Glasgow City Council is not responsible for. On the constituency element of the vote the Glasgow electoral region is represented by 9 Scottish National MSP's. On the regional vote the Glasgow electoral region is represented by 4 Labour MSP's, 2 Conservative MSP's and 1 Green MSP. Following the referendum the SNP won every constituency in the city at the 2015 General Election, including a record-breaking 39.3% swing in the seat of Glasgow North East. Glasgow is currently represented by 6 Scottish National MP's, with 1 Independent MP in Glasgow East (elected as SNP). 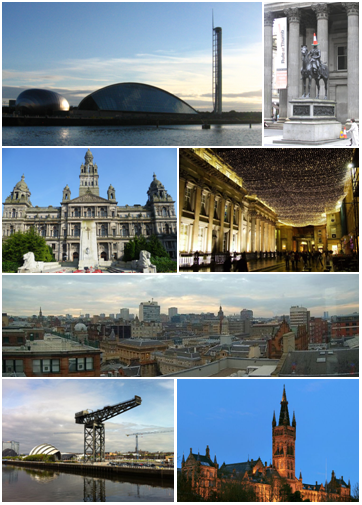 Glasgow is located on the banks of the River Clyde, in West Central Scotland. Its second most important river is the Kelvin whose name was used in creating the title of Baron Kelvin and thereby ended up as the SI unit of temperature. On older maps Glasgow is shown within the area of the pre-1975 county of Lanarkshire; from 1975 to 1996 it appears within Strathclyde Region; more recent maps will generally show Glasgow as one of 32 Council Areas in Scotland. Winters are cool and overcast, with a January mean of 5.0 °C (41.0 °F), though lows sometimes fall below freezing. Since 2000 Glasgow has experienced few very cold, snowy and harsh winters where temperatures have fallen much below freezing. The most extreme instances have however seen temperatures around −12 °C (10.4 °F) in the area. Snowfall accumulation is infrequent and short-lived. The spring months (March to May) are usually mild and often quite pleasant. Many of Glasgow's trees and plants begin to flower at this time of the year and parks and gardens are filled with spring colours. During the summer months (June to August) the weather can vary considerably from day to day ranging from relatively cool and wet to quite warm with the odd sunny day. Long dry spells of warm weather are generally very scarce. Overcast and humid conditions without rain are frequent. Generally the weather pattern is quite unsettled and erratic during these months, with only occasional heatwaves. The warmest month is usually July, with average highs above 20 °C (68 °F). Summer days can occasionally reach up to 27 °C (81 °F), and very rarely exceed 30 °C (86 °F). Autumns are generally cool to mild with increasing precipitation. During early autumn there can be some settled periods of weather and it can feel pleasant with mild temperatures and some sunny days. The official Met Office data series goes back to 1959 and shows that there only have been a few warm and no hot summers in Glasgow, in stark contrast to areas further south in Great Britain and eastwards in Europe. The warmest month on record in the data series is July 2006, with an average high of 22.7 °C (72.9 °F) and low of 13.7 °C (56.7 °F). Even this extreme event only matched a normal summer on similar parallels in continental Europe, underlining the maritime influences. The coldest month on record since the data series began is December 2010, during a severe cold wave affecting the British Isles. Even then, the December high was above freezing at 1.6 °C (34.9 °F) with the low of −4.4 °C (24 °F). This still ensured Glasgow's coldest month of 2010 remained milder than the isotherm of −3 °C (26.6 °F) normally used to determine continental climate normals. Temperature extremes have ranged from −19.9 °C (−4 °F) to 31.2 °C (88 °F), at Abbotsinch, and −14.8 °C (5 °F) to 31.0 °C (88 °F) at Paisley. The coldest temperature to have occurred in recent years was −12.5 °C (9 °F) at Bishopton during December 2010. In the 1950s the population of the City of Glasgow area peaked at 1,089,000. Glasgow was then one of the most densely populated cities in the world. After the 1960s, clearances of poverty-stricken inner city areas like the Gorbals and relocation to "new towns" such as East Kilbride and Cumbernauld led to population decline. In addition, the boundaries of the city were changed twice during the late 20th century, making direct comparisons difficult. The city continues to expand beyond the city council boundaries into surrounding suburban areas, encompassing around 400 square miles (1,040 km2) of all adjoining suburbs, if commuter towns and villages are included. There are two distinct definitions for the population of Glasgow: the Glasgow City Council Area (which lost the districts of Rutherglen and Cambuslang to South Lanarkshire in 1996) and the Greater Glasgow Urban Area (which includes the conurbation around the city). Glasgow's population influx in the 18th and 19th centuries was related to economic expansion as well as internally generated growth with the vast majority of newcomers to the city from outwith Scotland being from Ireland, especially the north western counties of Donegal, Fermanagh, Tyrone and Derry. In the 1881 Census, 83% of the population was born in Scotland, 13% in Ireland, in England 3% and 1% elsewhere. By 1911 the city was no longer gaining population by migration. The demographic percentages in the 1951 census were: born in Scotland 93%, Ireland 3%, England 3% and elsewhere 1%. In the early 20th century, many Lithuanian refugees began to settle in Glasgow and at its height in the 1950s there were around 10,000 in the Glasgow area. Many Italian Scots also settled in Glasgow, originating from provinces like Frosinone between Rome and Naples and Lucca in north-west Tuscany at this time, many originally working as "Hokey Pokey" men. In the 1960s and 1970s, many Asian-Scots also settled in Glasgow, mainly in the Pollokshields area. These number 30,000 Pakistanis, 15,000 Indians and 3,000 Bangladeshis as well as Chinese immigrants, many of whom settled in the Garnethill area of the city. Since 2000, the UK government has pursued a policy of dispersal of asylum seekers to ease pressure on social housing in the London area. The city is also home to some 8,406 (1.42%) Polish people. Since the United Kingdom Census 2001 the population decline has been reversed. The population was static for a time; but due to immigration from other parts of Scotland as well as from overseas, the population has begun to grow. The population of the city council area was 593,245 in 2011 and around 2,300,000 people live in the Glasgow travel to work area. This area is defined as consisting of over 10 per cent of residents travelling into Glasgow to work and is without fixed boundaries. The population density of London following the 2011 census was recorded as 5,200 people per square kilometre, while 3,395 people per square kilometre were registered in Glasgow. In 1931 the population density was 16,166 /sq mi (6,242 /km2), highlighting the "clearances" into the suburbs and new towns that were built to reduce the size of one of Europe's most densely populated cities. The main shopping centres are Buchanan Galleries and the St. Enoch Centre, with the up-market Princes Square, which specifically features shops such as Ted Baker, Radley and Kurt Geiger. The Italian Centre also specialises in designer labels. The London-based department store Selfridges purchased a site in the city some years ago as part of its plans to expand stores—plans now shelved, according to the company. Glasgow's retail portfolio forms the UK's second largest and most economically important retail sector after Central London. Of the 10 largest general insurance companies in the UK, 8 have a base or head office in Glasgow — including Direct Line, Esure, AXA and Norwich Union. Key banking sector companies have also moved some of their services to commercial property in Glasgow — Resolution, JPMorgan Chase, Abbey, HBOS, Barclays Wealth, Tesco Personal Finance, Morgan Stanley, Lloyds TSB, Clydesdale Bank, BNP Paribas, HSBC, Santander and the Royal Bank of Scotland. The Ministry of Defence have several departments and Clydeport, the Glasgow Stock Exchange, Student Loans Company, Scottish Executive Enterprise, Transport and Lifelong Learning Department, BT Group, Scottish Friendly. Scottish Qualifications Authority and Scottish Enterprise also have their headquarters based in the district. Royal Dutch Shell also have one of their six worldwide Shared Business Centres located in the IFSD. Hilton Worldwide have corporate office base in Cadogan Street. Glasgow's West End is a bohemian district of cafés, tea rooms, bars, boutiques, upmarket hotels, clubs and restaurants in the hinterland of Kelvingrove Park, the University of Glasgow, Glasgow Botanic Gardens and the Scottish Exhibition and Conference Centre, focused especially on the area's main thoroughfare, Byres Road. The area is popular with tourists, and contains many hotels. The East End Healthy Living Centre (EEHLC) was established in mid-2005 at Crownpoint Road with Lottery Funding and City grants to serve community needs in the area. Now called the Glasgow Club Crownpoint Sports Complex, the centre provides service such as sports facilities, health advice, stress management, leisure and vocational classes. Much of the wealth of the south side is in the towns of Whitecraigs, Giffnock and Thorntonhall. Examples of these are Castlemilk and Arden. Some working class areas that are still not very affluent exist in the form of Thornliebank. Although predominantly residential, the area does have several notable public buildings including, Charles Rennie Mackintosh's Scotland Street School Museum and House for an Art Lover; the world-famous Burrell Collection in Pollok Country Park; Alexander 'Greek' Thomson's Holmwood House villa; the National Football Stadium Hampden Park in Mount Florida, (home of Queens Park FC) and Ibrox Stadium, (home of Rangers FC). In recent years, the success of bands such as The Blue Nile, Gun, Simple Minds, Del Amitri, Texas, Hipsway, Love & Money, Idlewild, Deacon Blue, Orange Juice, Lloyd Cole and the Commotions, Teenage Fanclub, Belle and Sebastian, Camera Obscura, Franz Ferdinand, Mogwai, Travis, and Primal Scream has significantly boosted the profile of the Glasgow music scene, prompting Time Magazine to liken Glasgow to Detroit during its 1960s Motown heyday. More recent successes include The Fratellis, Chvrches, Rustie, Glasvegas and Twin Atlantic. The city of Glasgow was appointed a UNESCO City of Music on 20 August 2008 as part of the Creative Cities Network. Both BBC Scotland and STV have their headquarters in Glasgow. Television programs filmed in Glasgow include Rab C. Nesbitt, Taggart, High Times, River City, City Lights, Chewin' the Fat and Still Game. Most recently the long-running series Question Time and the early evening quiz programme Eggheads moved its production base to the city, Most of National Lottery game shows are also filmed in Glasgow, Children's Game Show Copycats is also filmed there, and the Irish/UK programme Mrs. Brown's Boys is also filmed at BBC Scotland. The Scottish press publishes various newspapers in the city such as the Evening Times, The Herald, The Sunday Herald, the Sunday Mail and the Daily Record. Scottish editions of Trinity Mirror and News International titles are printed in the city. STV Group is a Glasgow-based media conglomerate with interests in television, and publishing advertising. STV Group owns and operates both Scottish ITV franchises (Central Scotland and Grampian), both branded STV. Glasgow also has its own TV Channel, STV Glasgow was launched in June 2014, it also shows some of Glasgow's own programs filmed at the STV Headquarters in Glasgow, shows include The Riverside Show, Scottish Kitchen, City Safari, Football Show and Live at Five. Glasgow is a city of significant religious diversity. The Church of Scotland and the Roman Catholic Church are the two largest Christian denominations in the city. There are 147 congregations in the Church of Scotland's Presbytery of Glasgow  (of which 104 are within the city boundaries, the other 43 being in adjacent areas such as Giffnock). Within the city boundaries there are 65 parishes of the Roman Catholic Archdiocese of Glasgow  and four parishes of the Diocese of Motherwell. The city has four Christian cathedrals: Glasgow Cathedral, of the Church of Scotland; St Andrew's Cathedral, of the Roman Catholic Church; St Mary's Cathedral, of the Scottish Episcopal Church, and St Luke's Cathedral, of the Greek Orthodox Church. The city has three international airports within 45 minutes travel of the city centre, as well as a centrally-located seaplane terminal. Two are dedicated to Glasgow while the third is Edinburgh International which, as it is situated on the west side of Edinburgh, is relatively close to Glasgow. These airports are Glasgow Airport (GLA) (8 miles (10 km) west of the city centre) in Renfrewshire, Glasgow Prestwick Airport (PIK) (30 miles (50 km) south west) in Ayrshire, Edinburgh Airport (EDI), (34 miles (50 km) east) in Edinburgh, and Glasgow Seaplane Terminal, by the Glasgow Science Centre on the River Clyde. There are also several smaller, domestic and private airports around the city. There is a heliport, Glasgow City Heliport located at Stobcross Quay on the banks of the Clyde. Glasgow is known for its tenements – the red and blond sandstone buildings are some of the most recognisable features of the city. These were the most popular form of housing in 19th- and 20th-century Glasgow and remain the most common form of dwelling in Glasgow today. Tenements are commonly bought by a wide range of social types and are favoured for their large rooms, high ceilings and original period features. 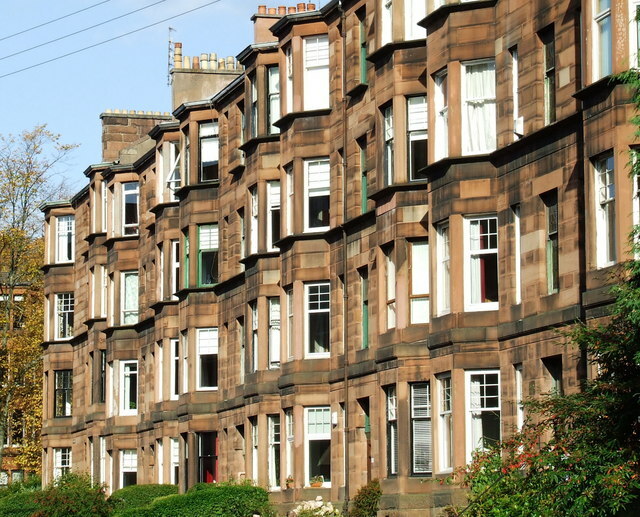 The Hyndland area of Glasgow is the only tenement conservation area in the UK and includes some tenement houses with as many as six bedrooms. Glasgow is one of only four cities (along with Liverpool in 1985, Madrid in 1986, 2014 and 2016 and Milan in 1994) to have had two football teams in European finals in the same season: in 1967 Celtic F.C. competed in the European Cup final with rivals Rangers F.C. competing in the Cup Winners' Cup final. Rangers were the first football club from the UK to reach a European final, which they achieved in 1961. They have also won more domestic top tier league titles than any other football club in the world. Celtic were the first non-Latin club to win the European Cup, under the management of Jock Stein in 1967, before Manchester United the following year. Celtic also went on to reach another European Cup Final in 1970, losing to Feyenoord Rotterdam, and also the final of the UEFA Cup in 2003, where they lost an enthralling match which finished 3–2 to Portuguese club Porto. Rangers also reached the final of the same competition in 2008, where they lost to Zenit Saint Petersburg of Russia. Glasgow bid to host the 2018 Summer Youth Olympics but lost to Buenos Aires in the 4 July 2013 vote. 29 November 2013 – 2013 Glasgow helicopter crash – Friday, 29 November 2013 a Eurocopter EC135-T2+ operated by Bond Air Services for Police Scotland fell from the sky and crashed on top of the Clutha Vaults, a pub on the north banks of the River Clyde. Ten people were killed in the incident including all occupants of the Helicopter, and seven on the ground and inside the pub. The exact cause as to why the helicopter crashed is still under investigation. 22 December 2014 – 2014 Glasgow bin lorry crash – At approximately 14:30 GMT, six people were killed and many seriously injured after a bin lorry careered out of control colliding with pedestrians and a Skoda Octavia Private Hire car before coming to rest outside the Millennium Hotel. It is believed the driver of the Refuse Truck suffered from heart difficulties, the exact cause is still under investigation. 29 December 2014 – first Ebola virus case in Scotland – Pauline Cafferkey, a nurse returning to Glasgow from Kerry Town treatment centre, Sierra Leone, West Africa where she had been a volunteer caring for patients infected with the Ebola virus was taken into isolation after testing positive for the virus. She was not diagnosed before leaving West Africa. ^ "Analyser UV02". http://www.scrol.gov.uk/scrol/analyser/analyser?topicId=1&tableId=UV02&tableName=Population+density&selectedTopicId=&aggregated=false&subject=&tableNumber=&selectedLevelId=&postcode=&areaText=&RADIOLAYER=&actionName=view-results&clearAreas=&stateData1=&stateData2=&stateData3=&stateData4=&debug=&tempData1=&tempData2=&tempData3=&tempData4=&areaId=17&levelId=1. Retrieved 4 August 2007. ^ "Glasgow City Council Area". National Records of Scotland. 5 May 2016. http://www.nrscotland.gov.uk/files/statistics/council-area-data-sheets/glasgow-city-factsheet.pdf. Retrieved 2 May 2016. ^ "2007 Population Estimates" (PDF). Archived from the original on 27 February 2008. https://web.archive.org/web/20080227084144/http://www.glasgow.gov.uk/NR/rdonlyres/E3BE21DA-4D84-4CC4-9C02-2E526FDD9169/0/populationaug07.pdf. Retrieved 16 January 2008. ^ "Definition of Glasgow in Oxford dictionary. Meaning, pronunciation and origin of the word". Oxford University Press. 2013. http://www.oxforddictionaries.com/definition/english/Glasgow. Retrieved 12 January 2014. ^ "Victorian Glasgow". BBC History. http://www.bbc.co.uk/history/scottishhistory/victorian/trails_victorian_glasgow.shtml. Retrieved 14 September 2010. ^ "About Glasgow: The Second City of the Empire — the 19th century". Glasgow City Council. Archived from the original on 2 April 2007. https://web.archive.org/web/20070402171109/http://www.glasgow.gov.uk/en/AboutGlasgow/History/The+Second+City.htm. Retrieved 9 July 2007. ^ Fraser, W, H. "Second City of The Empire: 1830s to 1914". University of Glasgow. http://www.theglasgowstory.com/storyd.php. Retrieved 7 January 2008. ^ McIlvanney, W. "Glasgow — city of reality". Scotland — the official online gateway. http://www.scotland.org/about/innovation-and-creativity/features/culture/vibrant6-glasgow.html. Retrieved 7 January 2008. ^ "Factsheet 4: Population" (PDF). Glasgow City Council. Archived from the original on 3 July 2007. https://web.archive.org/web/20070703130648/http://www.glasgow.gov.uk/NR/rdonlyres/E3BE21DA-4D84-4CC4-9C02-2E526FDD9169/0/4population.pdf. Retrieved 9 July 2007. ^ "United Kingdom: Countries and Major Urban Areas". citypopulation.de. http://www.citypopulation.de/UK-UA.html. ^ a b "Minister backs SPT on White Paper". Interchange Issue 7. Strathclyde Partnership for Transport. September 2004. Archived from the original on 13 June 2007. https://web.archive.org/web/20070613072504/http://www.spt.co.uk/Publications/interchange/issue07.html. Retrieved 9 July 2007. ^ a b "News: Census 2011: Population estimates for Scotland". The National Archives of Scotland. 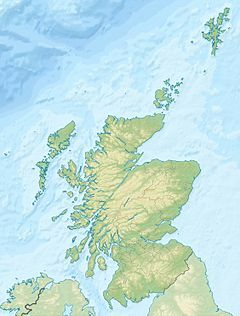 The National Records of Scotland. 17 December 2012. http://www.nas.gov.uk/about/121217.asp. Retrieved 17 October 2013. ^ Alcock & Alcock, Excavations at Alt Clut; Koch, The Place of Y Gododdin. Barrell, Medieval Scotland, p. 44, supposes that the diocese of Glasgow established by David I in 1128 may have corresponded with the late kingdom of Strathclyde. ^ Donnachie, Ian (2004). "The Glasgow Story: Industry and Technology — Food, Drink and Tobacco". The Glasgow Story. http://www.theglasgowstory.com/story.php?id=TGSCE03. Retrieved 29 July 2008. ^ Fraser, W. Hamish (2004). "Second City of The Empire: 1830s to 1914". The Glasgow Story. http://www.theglasgowstory.com/storyd.php. Retrieved 9 July 2008. ^ "Industrial decline — the 20th Century". Glasgow City Council. 28 March 2007. http://www.theglasgowstory.com/storyd.php. Retrieved 9 July 2008. ^ a b Staples, John (5 September 2002). "Secret plot to strip Glasgow of influence". The Scotsman. UK. Archived from the original on 19 January 2005. https://web.archive.org/web/20050119043309/http://thescotsman.scotsman.com/index.cfm?id=986122002. Retrieved 11 December 2007. ^ Alderson, Reevel (23 June 2008). "Why Glasgow was 'miles better'". BBC News. http://news.bbc.co.uk/1/hi/scotland/7468870.stm. Retrieved 30 July 2008. ^ "Interim Evaluation of the Cities Growth Fund: A Report to the Scottish Executive — Appendix 4: Glasgow". Scottish Government. March 2007. Archived from the original on 2 March 2012. https://web.archive.org/web/20120302023804/http://openscotland.gov.uk/Publications/2007/03/27153210/10. Retrieved 26 June 2008. ^ McIntyre, Zhan (2006). "Housing regeneration in Glasgow: Gentrification and upward neighbourhood trajectories in a post-industrial city" (PDF). eSharp. http://www.gla.ac.uk/media/media_41198_en.pdf. Retrieved 10 July 2008. ^ Carrell, Severin (15 October 2008). "Lonely Planet guide rates Glasgow as one of the world's top 10 cities". The Guardian (London). http://www.guardian.co.uk/travel/2008/oct/15/glasgow-scotland. Retrieved 15 October 2008. ^ a b "Breakthrough Glasgow" (PDF). The Centre for Social Justice. 1 February 2008. http://news.bbc.co.uk/1/shared/bsp/hi/pdfs/breakthroughglasgow_05_02_08.pdf. Retrieved 8 February 2008. ^ a b c "Glasgow Economic Audit 2007—Summary Report" (PDF). Glasgow Economic Forum. 2007. Archived from the original on 25 June 2008. https://web.archive.org/web/20080625035435/http://www.glasgow.gov.uk/NR/rdonlyres/2D5AF9D8-CE27-40D1-9BDF-47020507440A/0/GlasgowEconomicAudit2007SummaryReportFinal.pdf. Retrieved 10 July 2008. ^ "Quality of living global city rankings — Mercer survey". http://www.mercer.com/referencecontent.htm?idContent=1307990. Retrieved 10 July 2008. ^ "Air quality | The Glasgow Indicators Project". Understandingglasgow.com. http://www.understandingglasgow.com/indicators/environment/air_quality. Retrieved 25 March 2012. ^ "Election 2015: SNP wins 56 of 59 seats in Scots landslide". BBC News. http://www.bbc.co.uk/news/election-2015-scotland-32635871. ^ a b "Climate Station Data for Paisley". Met Office. http://www.metoffice.gov.uk/pub/data/weather/uk/climate/stationdata/paisleydata.txt. Retrieved 28 October 2015. ^ "December 1995 minimum". http://www.tutiempo.net/en/Climate/Glasgow_Airport/12-1995/31400.htm. Retrieved 31 October 2011. ^ "August 1975 Maximum". http://weatherfaqs.org.uk/book/export/html/179. Retrieved 31 October 2011. ^ "December 1982 minimum". http://eca.knmi.nl/utils/monitordetail.php?seasonid=7&year=1982&indexid=TNn&stationid=1636. Retrieved 31 October 2011. ^ "August 1975 Maximum". http://eca.knmi.nl/utils/monitordetail.php?seasonid=14&year=1975&indexid=TXx&stationid=1636. Retrieved 31 October 2011. ^ "December 2010 minimum". http://metofficenews.wordpress.com/2010/12/08/minimum-temperatures-and-snow-across-the-uk-last-night/. Retrieved 31 October 2011. ^ "Mid-2005 Population Estimates Scotland – Table 9 Land area and population density, by administrative area: 30 June 2005" (Microsoft Excel). General Register Office for Scotland. http://www.gro-scotland.gov.uk/files/05mype-cahb-t9.xls. Retrieved 9 July 2007. ^ scrol.gov.uk/. "2001 Census". http://www.scrol.gov.uk/scrol/analyser/analyser?topicId=1&tableId=&tableName=Population+density&selectedTopicId=&aggregated=false&subject=&tableNumber=&selectedLevelId=&postcode=&areaText=&RADIOLAYER=&actionName=view-results&clearAreas=&stateData1=&stateData2=&stateData3=&stateData4=&debug=&tempData1=&tempData2=&tempData3=&tempData4=&areaId=17&levelId=1. Retrieved 9 July 2007. ^ "Lithuanians in Glasgow". The Guardian (London). 23 January 2006. http://www.guardian.co.uk/g2/story/0,,1692714,00.html. Retrieved 9 July 2007. ^ Gray, Alastair; Moffat, William (1989) . "Departures and Arrivals". A History of Scotland (Rev ed.). Oxford: Oxford University Press. p. 39. ISBN 978-0-19-917063-0. https://books.google.com/books?id=GGhvmMCbQLUC&pg=PA39&lpg=PA39&dq=italians+scotland+%22hokey+pokey%22&source=web&ots=l_dzI1MviK&sig=D9WM0_yJU5aCPHC4ccYUqMlei7c#PPA39,M1. Retrieved 9 July 2007. ^ "Statistical Bulletin". National Records of Scotland. 17 December 2012. http://www.scotlandscensus.gov.uk/documents/censusresults/release1a/rel1asb.pdf. Retrieved 17 October 2013. ^ "Review of Scotland's Cities — Transport within the City and the City-Region". Scottish Executive. http://www.scotland.gov.uk/Publications/2003/01/15950/15151. Retrieved 12 December 2007. ^ Rogers, Simon (16 July 2012). "2011 census results: how many people live in your local authority?". The Guardian. http://www.theguardian.com/uk/datablog/2012/jul/16/2011-census-results-data#. Retrieved 17 October 2013. ^ "Glasgow: Population & Density 1891–2001". Demographia. Wendell Cox Consultancy. 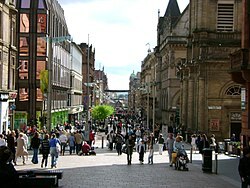 http://www.demographia.com/db-glasgow.htm. Retrieved 12 December 2007. ^ "Life expectancy gap "widening"". BBC News. 29 April 2005. http://news.bbc.co.uk/1/hi/health/4494051.stm. Retrieved 28 August 2008. ^ Walker, Carole (25 July 2008). "How serious is defeat for Brown?". BBC News. http://news.bbc.co.uk/1/hi/uk_politics/7524663.stm. Retrieved 28 August 2008. ^ "Social factors key to ill health". BBC News. 28 August 2008. http://news.bbc.co.uk/1/hi/health/7584056.stm#Life%20expectancy. Retrieved 28 August 2008. ^ "GP explains life expectancy gap". BBC News. 28 August 2008. http://news.bbc.co.uk/1/hi/scotland/glasgow_and_west/7584450.stm. Retrieved 28 August 2008. ^ Glasgow, People Make. "The Ultimate Guide to Shopping in Glasgow | People Make Glasgow | People Make Glasgow". https://peoplemakeglasgow.com/things-to-do/shopping. ^ "Shopping | Princes Square | Glasgow". http://www.princessquare.co.uk/shopping. ^ "Retail Ranking from Experian". Business-strategies.co.uk. Archived from the original on 26 March 2009. https://web.archive.org/web/20090326235054/http://www.business-strategies.co.uk/upload/newsletter_oct07/retail_market_spotlight_autumn2007.pdf. Retrieved 12 September 2009. ^ "Top of the Shops — Gerald Eve Publishes Prime Retail". Prnewswire.co.uk. 5 November 2004. http://www.prnewswire.co.uk/cgi/news/release?id=133843. Retrieved 12 September 2009. ^ "Glasgow's Merchant City: Historical Development". Merchant City Initiative. 2008. Archived from the original on 13 May 2008. https://web.archive.org/web/20080513203125/http://www.glasgowmerchantcity.net/history1.htm. Retrieved 29 July 2008. ^ "Merchant City Glasgow: Restaurants and Cafés". Merchant City Glasgow — Merchant City Initiative. 2008. Archived from the original on 16 June 2008. http://www.merchantcityglasgow.com/categories/4. Retrieved 30 July 2008. ^ "Merchant City Glasgow: Shops". Merchant City Glasgow — Merchant City Initiative. 2008. Archived from the original on 16 June 2008. http://www.merchantcityglasgow.com/categories/7. Retrieved 30 July 2008. ^ a b "Merchant City Glasgow: Galleries and Art". Merchant City Glasgow — Merchant City Initiative. 2008. Archived from the original on 16 June 2008. http://www.merchantcityglasgow.com/categories/2. Retrieved 30 July 2008. ^ "Trongate 103". 2008. http://www.trongate103.com/. Retrieved 30 July 2008. ^ "Merchant City Glasgow: Venues and Theatres". Merchant City Glasgow — Merchant City Initiative. 2008. Archived from the original on 16 June 2008. http://www.merchantcityglasgow.com/categories/1. Retrieved 30 July 2008. ^ "Let Glasgow flourish". Scotland: the official online gateway. http://www.scotland.org/about/innovation-and-creativity/features/business/glasgow-flourish.html. Retrieved 29 July 2008. ^ "Glasgow Conferences Venues UK". Conferences-uk.org.uk. 17 July 1995. http://www.conferences-uk.org.uk/Glasgow.asp?venue=Scottish%20Exhibition%20and%20Conference%20Centre. Retrieved 12 September 2009. ^ "The home of the Scottish Exhibition + Conference Centre". SECC. http://www.secc.co.uk/. Retrieved 12 September 2009. ^ "Scottish Exhibition and Conference Centre". http://www.venuefinder.com/venues/scottish_exhibition_+_conference_centre/V8654/meeting-rooms/. ^ "The Official Glasgow Barrowland Ballroom Site". Glasgow Barrowland. http://www.glasgow-barrowland.com/ballroom.htm. Retrieved 5 May 2009. ^ Glasgow Architecture (1999). "Homes for the Future, 1999". Glasgow Architecture. http://www.glasgowarchitecture.co.uk/homes_for_the_future_glasgow.htm. Retrieved 12 September 2009. ^ "Templeton's Carpet Factory, Glasgow". princes-regeneration.org. http://www.princes-regeneration.org/bestpractice/tempcarp.htm. ^ "East End Healthy Living Centre Homepage". Eehlc.org.uk. 17 October 2013. http://www.eehlc.org.uk/. Retrieved 5 May 2014. ^ "Pollok Park Britain's Best Park". Glasgow City Council. Archived from the original on 15 June 2008. https://web.archive.org/web/20080615135645/http://www.glasgow.gov.uk/en/Residents/Parks_Outdoors/Parks_gardens/pollokparkbritainsbestpark.htm. Retrieved 20 June 2008. ^ Nicoll, Vivienne. "Starting gun sounds for regeneration of Sighthill". http://www.eveningtimes.co.uk/news/starting-gun-sounds-for-regeneration-of-sighthill-158767n.23892373. Retrieved 26 August 2014. ^ Glasgow City Council. "Cultural renaissance: the 1980s and 1990s". Archived from the original on 18 April 2008. https://web.archive.org/web/20080418153731/http://www.glasgow.gov.uk/en/AboutGlasgow/History/Cultural+Renaissance.htm. Retrieved 13 May 2008. ^ History of The Mitchell Archived September 14, 2010 at the Wayback Machine. ^ Hancox, John. "Glasgow's first poet laureate". Avenue. Archived from the original on 7 October 2006. https://web.archive.org/web/20061007181932/http://www.gla.ac.uk:443/avenue/27/poet.html. Retrieved 9 July 2007. ^ "Liz Lochhead". http://literature.britishcouncil.org/liz-lochhead. Retrieved 18 February 2015. ^ "Liz Lochhead appointed as makar, Scotland's national poet". http://www.theguardian.com/books/2011/jan/19/liz-lochhead-makar-scotland-national-poet. Retrieved 18 February 2015. ^ "Lord Provost announces appointment of new Poet Laureate for Glasgow". http://www.heraldscotland.com/arts-ents/books-poetry/lord-provost-announces-appointment-of-new-poet-laureate-for-glasgow.1405607580. Retrieved 18 February 2015. ^ McQueen, Craig (14 August 2013). "Glasgow awarded unlikely title of Britain's most vegan friendly city by animal activists". Daily Record. http://www.dailyrecord.co.uk/news/scottish-news/glasgow-awarded-unlikely-title-britains-2162879. Retrieved 5 May 2014. ^ "SLTN Awards". 10 November 2011. http://sltn.co.uk/2011/11/10/capital-stars-as-denise-belts-out-sltn-winners/. Retrieved 13 November 2011. ^ a b Smith, Richard. "Bristol named Britain's most musical city". Daily Mirror. http://www.mirror.co.uk/celebs/news/2010/03/13/bristol-named-britain-s-most-musical-city-115875-22107650/. Retrieved 25 August 2011. ^ "Glasgow 'most mentioned UK city' in song titles". BBC News. http://www.bbc.co.uk/news/uk-scotland-glasgow-west-16854997. ^ Seenan, Gerard (4 September 2004). "Rock bands inspire Belle epoque for Glasgow scene". The Guardian (London). http://arts.guardian.co.uk/news/story/0,11711,1297055,00.html. Retrieved 9 July 2007. ^ "InTheMix.com.au". InTheMix.com.au. 28 May 2002. http://www.inthemix.com.au/news/intl/942/Slam_Glasgow_funerals_beat_Edinburgh_weddings. Retrieved 12 September 2009. ^ "Scottish Radio Statistics". Allmediascotland.com. Archived from the original on 9 January 2009. https://web.archive.org/web/20090109043017/http://www.allmediascotland.com/articles/1261/10052007/bbc_celebrating_radio_high_in_scotland. Retrieved 12 September 2009. ^ "Glasgow Gurdwara: £3.8m Sikh temple prepares to open its doors". BBC. 26 April 2013. http://www.bbc.co.uk/news/uk-scotland-22300608. Retrieved 5 May 2014. ^ "Faith Communities and Local Government in Glasgow". The Scottish Government. http://www.scotland.gov.uk/Publications/2005/11/08142443/24477. Retrieved 12 September 2009. ^ "MCB Muslim Population". Mcb.org.uk. http://www.mcb.org.uk/library/statistics.php. Retrieved 12 September 2009. ^ "Glasgow Jewish Community". JewishGen.org. http://www.jewishgen.org/jcr-uk/Community/glasgow.htm. Retrieved 12 September 2016. ^ "St Mungo Museum of Religious Life and Art". Seeglasgow.com. Archived from the original on 29 January 2009. https://web.archive.org/web/20090129155747/http://www.seeglasgow.com/seeglasgow/museums-and-galleriesnew/history-and-heritage-/st-mungo-museum. Retrieved 12 September 2009. ^ "St. Mungo Museum". Clyde-valley.com. http://www.clyde-valley.com/Glasgow/mungomus.htm. Retrieved 12 September 2009. ^ Watch video of the church and Interview with Stuart Robertson, Charles Rennie Mackintosh Society Director Archived June 5, 2009 at the Wayback Machine. ^ "Museum of Transport Glasgow". Glasgow Architecture. http://www.glasgowarchitecture.co.uk/museum_of_transport_glasgow.htm. Retrieved 8 August 2011. ^ "Riverside Museum: Scotland's museum of transport and travel". http://www.glasgowlife.org.uk/museums/riverside-museum/. Retrieved 8 August 2011. ^ "Glasgow: Scotland with style — City of Reinvention By Nancy McLardie". Seeglasgow.com. http://www.seeglasgow.com/media-office/features/history/city-of-reinvention. Retrieved 12 September 2009. ^ "Glasgow City Council: Regeneration — into the new Millennium". Glasgow.gov.uk. 28 March 2007. Archived from the original on 26 May 2009. https://web.archive.org/web/20090526235624/http://www.glasgow.gov.uk/en/AboutGlasgow/History/Regeneration.htm. Retrieved 12 September 2009. ^ MacDonnell, Hamish (3 March 2005). "Edinburgh UK's second most prosperous city". The Scotsman (UK). http://www.scotsman.com/news/edinburgh-uk-s-second-most-prosperous-city-1-738231. Retrieved 28 May 2012. ^ Seenan, Gerrard (17 September 2005). "Jobs boom on Clyde reverses decline". The Guardian (UK). http://www.guardian.co.uk/uk_news/story/0,,1572109,00.html. Retrieved 12 December 2007. ^ "Let Glasgow Flourish". Scotland.org. April 2007. http://www.scotland.org/about/innovation-and-creativity/features/business/glasgow-flourish.html. Retrieved 9 July 2007. ^ "Glasgow and Surrounding Areas". Scotland Online Gateway. http://www.scotland.org/about/glasgow-and-surrounding-areas/index.html. Retrieved 9 July 2007. ^ "The Second City". Glasgow.gov.uk. 18 January 2008. Archived from the original on 16 June 2011. https://web.archive.org/web/20110616125656/http://www.glasgow.gov.uk/en/AboutGlasgow/History/The+Second+City.htm. Retrieved 25 August 2011. ^ "16th and 17th Centuries". Glasgow.gov.uk. 28 March 2007. Archived from the original on 28 July 2011. https://web.archive.org/web/20110728172827/http://www.glasgow.gov.uk/en/AboutGlasgow/History/16th+and+17th+Centuries.htm. Retrieved 25 August 2011. ^ "Inbound tourism performance". VisitBritain. http://www.visitbritain.org/insightsandstatistics/inboundvisitorstatistics/. ^ "Glasgow's financial services economy". International Financial Services District Glasgow. Archived from the original on 8 January 2008. https://web.archive.org/web/20080108151012/http://www.ifsdglasgow.co.uk/district.asp?page_id=32. Retrieved 9 July 2007. ^ "Edinburgh's Ranking". Archived from the original on 11 October 2007. https://web.archive.org/web/20071011191337/http://www.edinburghbrand.com/news/information/. Retrieved 9 July 2007. ^ "The Global Financial Centres Index — Sept 2008" (PDF). City of London Corporation. http://213.86.34.248/NR/rdonlyres/102CD2E5-FB72-4B9B-A30C-56FD592B5B61/0/BC_RS_GFCI4.pdf. Retrieved 28 December 2008. ^ "Financial services jobs for Glasgow". The Scottish Government. http://www.scotland.gov.uk/News/Releases/2006/11/20112301. Retrieved 28 December 2008. ^ BBC Scotland "Call centres 'enjoying boom time'". BBC. 10 January 2007. http://news.bbc.co.uk/1/hi/scotland/glasgow_and_west/6247869.stm. Retrieved 12 September 2009. ^ Hilpern, Kate (20 May 2001). "Slavery abolished in call centres". London: The Independent Newspaper. http://www.independent.co.uk/news/business/news/slavery-abolished-in-call-centres-685305.html. Retrieved 20 May 2001. ^ "West Coast Main Line Pendolino Tilting Trains, United Kingdom". Railway-technology.com. http://www.railway-technology.com/projects/virgin/. Retrieved 25 August 2011. ^ SPT (16 April 1980). "SPT Subway". Web.archive.org. Archived from the original on 29 December 2007. https://web.archive.org/web/20071229231523/http://www.spt.co.uk/subway/facts.html. Retrieved 12 September 2009. ^ "PS Waverley". Waverleyexcursions.co.uk. Archived from the original on 17 August 2009. https://web.archive.org/web/20090817181830/http://www.waverleyexcursions.co.uk/waverley.htm. Retrieved 12 September 2009. ^ "Seaplane air service to take off". BBC News. 27 November 2006. http://news.bbc.co.uk/1/hi/scotland/glasgow_and_west/6187102.stm. Retrieved 9 July 2007. ^ "Ministers scrap airport rail plan". BBC News. 17 September 2009. http://news.bbc.co.uk/1/hi/scotland/8256474.stm. ^ Brown welcomes airport study. . transportscotland.gov.uk. 27 February 2014. http://www.transport.gov.scot/news/brown-welcomes-airport-study. Retrieved 19 March 2016. ^ "Victorian Achievement: Victorian Glasgow". BBC. http://www.bbc.co.uk/history/scottishhistory/victorian/trails_victorian_glasgow.shtml. Retrieved 30 March 2008. ^ a b McLean, Jack (13 August 2000). "Tenement living is the life and always has been". Sunday Herald. http://findarticles.com/p/articles/mi_qn4156/is_20000813/ai_n13950376. Retrieved 24 July 2009. ^ "Hyndland Local History". Hyndl.demon.co.uk. Archived from the original on 19 August 2011. https://web.archive.org/web/20110819050501/http://www.hyndl.demon.co.uk/hyndland/0mainindax.htm. Retrieved 10 March 2016. ^ Drivers for high rise living Archived March 11, 2012 at the Wayback Machine. ^ Exiles and Islanders: The Irish Settlers of Prince Edward Island by Brendan O'Grady. Books.google.co.uk. https://books.google.com/books?id=y4fZZeJqqRcC&pg=PA144&lpg=PA144&dq=irish+labour+glasgow+tenements&source=web&ots=wZ071BJL9Z&sig=jIEk-u0DZ4ev86Znpcw1d1CI8LA&hl=en#PPR1,M1. Retrieved 12 September 2009. ^ MacInnes, Ranald. "The Glasgow Story: Buildings and Cityscape — Public Housing". http://www.theglasgowstory.com/story.php?id=TGSEF11. Retrieved 24 July 2009. ^ a b "Springburn Virtual Museum: Demolition of tenements in Gourlay Street, 1975". Glasgow Digital Library. http://gdl.cdlr.strath.ac.uk/springburn/spring066.htm. Retrieved 12 September 2009. ^ "Glasgow announces a revolution in house-building". Glasgow.gov.uk. Archived from the original on 5 January 2009. https://web.archive.org/web/20090105180936/http://www.glasgow.gov.uk/en/News/Archives/2006/May/housingrevolutionannounced.htm. Retrieved 12 September 2009. ^ "HIS : Queen Elizabeth University Hospital". healthcareimprovementscotland.org. http://www.healthcareimprovementscotland.org/our_work/inspecting_and_regulating_care/opah_greater_glasgow_and_clyde/qeuh_dec_15.aspx. ^ McConnell, Ian (30 October 2012). "Scotshield wins hospital fire system contract". The Herald. http://www.heraldscotland.com/business/13078939.Scotshield_wins_hospital_fire_system_contract/. Retrieved 19 July 2015. ^ "2011 Census: KS501UK Qualifications and students, local authorities in the United Kingdom (Excel sheet 293Kb)". 2011 Census, Key Statistics and Quick Statistics for local authorities in the United Kingdom – Part 2. Office for National Statistics. 4 December 2013. http://www.ons.gov.uk/ons/rel/census/2011-census/key-statistics-and-quick-statistics-for-local-authorities-in-the-united-kingdom---part-2/rft-ks501uk.xls. Retrieved 29 March 2014. ^ "Glasgow Geographic profile". Scottish Enterprise. Archived from the original on 27 May 2007. https://web.archive.org/web/20070527083600/http://www.scottish-enterprise.com/sedotcom_home/about_se/local_enterprise_companies/glasgow/glasgow-geographicprofile.htm?siblingtoggle=1. Retrieved 9 July 2007. ^ "Hampden Stadium". Glasgow Photo Library. http://www.rampantscotland.com/glasgow/glw_hampden.htm. Retrieved 9 July 2007. ^ "Glasgow City Ladies Football Club". Glasgowcityladiesfc.co.uk. http://www.glasgowcityladiesfc.co.uk/. Retrieved 5 May 2014. ^ "Celtic Football Club". Scottish Professional Football League. http://spfl.co.uk/clubs/celtic/. Retrieved 11 November 2013. ^ "Partick Thistle Football Club". Scottish Professional Football League. http://spfl.co.uk/clubs/partickthistle/. Retrieved 11 November 2013. ^ "Rangers Football Club". Scottish Professional Football League. http://spfl.co.uk/clubs/rangers/. Retrieved 11 November 2013. ^ "Queen's Park Football Club". Scottish Professional Football League. http://spfl.co.uk/clubs/queenspark/. Retrieved 11 November 2013. ^ "Club History". westofscotlandfc.co.uk. http://www.westofscotlandfc.co.uk/about-us/club-history. ^ "Glasgow Dynamos Remembered". Glasgowdynamos.tripod.com. http://glasgowdynamos.tripod.com/. Retrieved 5 May 2014. ^ "European Capital of Sports Association". Aces-europa.eu. http://www.aces-europa.eu/Home/EuropeanCapitals/tabid/56/Default.aspx. Retrieved 25 August 2011. ^ "Rules as at 28 March 2004" (PDF). http://www.glasgowhumanesociety.com/documents/Rules_as_at_28-3-04.pdf. Retrieved 25 August 2011. ^ "Buenos Aires elected as Host City for 2018 Youth Olympic Games". International Olympic Committee. http://www.olympic.org/news/buenos-aires-elected-as-host-city-for-2018-youth-olympic-games/202222. Retrieved 5 May 2014. ^ "National Indoor Sports Arena". Robert McAlpine. 2011. http://www.sir-robert-mcalpine.com/projects/?id=18682. Retrieved 22 June 2011. 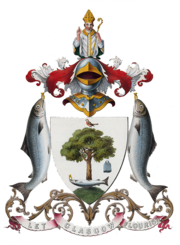 ^ "Glasgow City Council — Twin Cities — Glasgow City Council". Glasgow.gov.uk. 25 October 2013. http://www.glasgow.gov.uk/index.aspx?articleid=2978. Retrieved 25 October 2013. ^ Pessotto, Lorenzo. "International Affairs – Twinnings and Agreements". International Affairs Service in cooperation with Servizio Telematico Pubblico. City of Torino. Archived from the original on 18 June 2013. https://web.archive.org/web/20130618182559/http://www.comune.torino.it/relint/inglese/gemellaggieaccordi/index.shtml. Retrieved 6 August 2013. ^ "Glasgow 'twinned' with Lahore". Web.archive.org. 29 November 2006. Archived from the original on 29 November 2006. https://web.archive.org/web/20061129165526/http://www.eveningtimes.co.uk/hi/news/5057161.html. Retrieved 12 September 2009. ^ Leask, David (24 February 2007). "Holy row after Glasgow twins with Bethlehem". Herald (Glasgow). http://www.heraldscotland.com/holy-row-after-glasgow-twins-with-bethlehem-1.853287. Retrieved 1 November 2014. ^ "Bethlehem Municipality". bethlehem-city.org. Archived from the original on 24 July 2010. https://web.archive.org/web/20100724140854/http://www.bethlehem-city.org/Twining.php. Retrieved 10 October 2009. ^ "Partneri- ja kummikaupungit (Partnership and twinning cities)" (in Finnish). Oulun kaupunki (City of Oulu). http://www.ouka.fi/oulu/kansainvalisyys/partneri-ja-kummikaupungit. Retrieved 27 July 2013. Crawford, Robert (2013). On Glasgow and Edinburgh. Harvard U.P.. https://books.google.com/books?id=Z4k547Yzj6kC&pg=PA1723. "Glasgow". Encyclopædia Britannica. 12 (11th ed.). 1911. This page uses content from the English language Wikipedia. The original content was at Glasgow. The list of authors can be seen in the page history. As with this Familypedia wiki, the content of Wikipedia is available under the Creative Commons License.